This beautiful 1933 Singer 15-91 has just come off our restoration bench and such a gorgeous machine it is. This 15-91 is one of those less common finds that rather than the usual painted and numbered stitch-length plate, features a chrome plate with a window that shows your stitch length. Also different and very interesting, the Singer medallion is silver, rather than the usual brass plate. Even better, it seems to have been barely used so it has it's entire useful life ahead of it. This is almost like finding a brand new sewing machine made with the high quality materials and built to last a lifetime. A home sewing machine this good will never be built again. 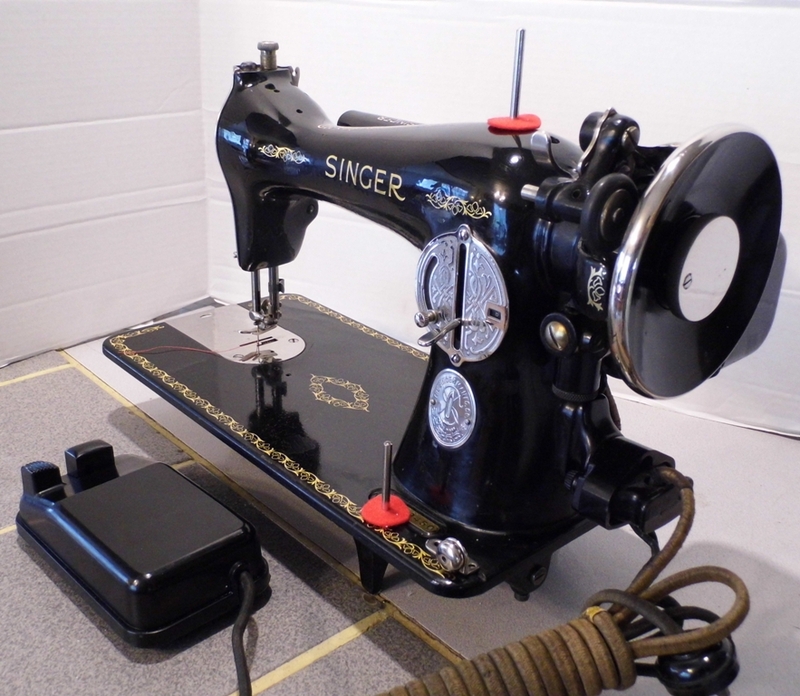 Included with this fine Singer are; the original white-cover user manual, Singer loop handle screwdriver, the attachment set in it's original Singer box, spare bobbins, and a Singer oil can which fits into a holder in the optional Singer cabinet, which is available but sold separately. The cabinet is sold separately, since we'll be paying the shipping for it and that can get spendy. We haven't found a furniture refinisher yet, so it comes as-is, in need of restoration, but it's sound and sturdy and has some great features, like the swing-out accessory drawers, thread storage, a Singer oil can holder (and the refillable can), and it's incredibly cute, too. The price of the cabinet will be $295.00, most of which will go to packing and shipping.See below for a separate Buy button to add the cabinet to your purchase. 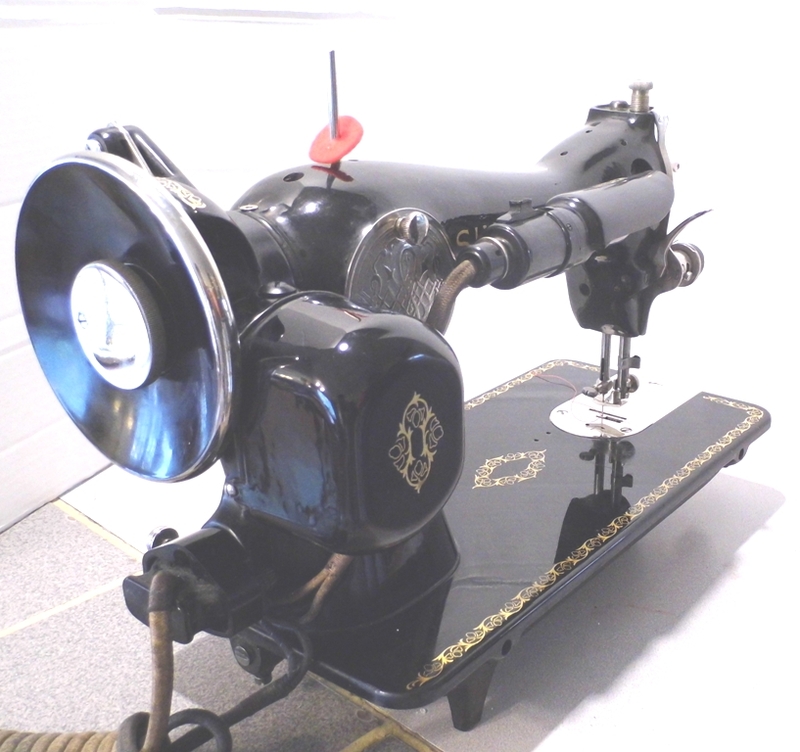 Here at Stagecoach Road Vintage Sewing Machine, we are passionate about what we love doing, which is restoring beautiful vintage sewing machines to the best that they can be, and over the decades we've restored, literally, hundreds of worthy sewing machines (actually we lost count at over two hundred, 15 years ago), and shipped them all over the country and beyond. Why? Because we are in love with the styling, the quality of the materials, the workmanship that went into these great machines, which just can't be duplicated today. We take out the needle bar and all it's linkages and the presser foot bar and all it's parts and scrub them in an alcohol bath to remove the years of sticky oil buildup that bogs down a vintage machine and robs it of speed and power. We don't try to hide the scratches or chips that have been honestly earned in service to their craft, and rarely re-paint because we prefer the original paint in most cases. We like the wabi-sabi beauty of a working sewing machine. And if the stickers from the various sewing machine service shops they've seen aren't too damaged we leave those, too, so you can see where your new machine has been in it's lifetime. Read the details of our Lifetime Guaranty on our website: http://StagecoachRoadSewing.Com. It's short and in readable English. Sorry to say that this machine is Sold, though the cabinet is still abailable. $295.00 with free shipping to your local Greyhound terminal.